SINGAPORE, Jan. 17, 2019 /PRNewswire/ -- As the global threat landscape continues to increase in size and complexity, so does the number of add-on security solutions designed to address these challenges. In response, enterprises around the world are turning to network solutions with built-in security. 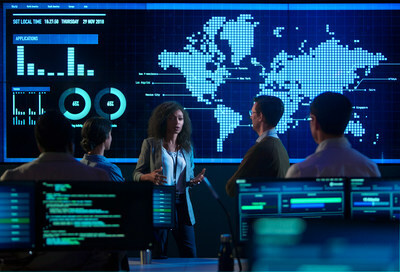 Today, CenturyLink, Inc. (NYSE: CTL) unveils its eighth global security operations center (SOC), offering customers in Asia Pacific greater ability to predict, protect and respond to internal and external threats with CenturyLink's network-based security solutions. To learn more about CenturyLink's security solutions in Asia Pacific, visit: https://www.centurylink.com.sg/security.html. "CenturyLink has had an operations center in Asia Pacific since the early 2000s to serve our customers' growing demands in scaling their digital businesses. With the launch of our SOC in Singapore today, enterprises are better protected through our comprehensive methodology of people, process and technology to tackle an ever-evolving threat landscape and help secure their digital futures," said Francis Thangasamy, vice president of product management in Asia Pacific for CenturyLink. "As part of CenturyLink's commitment to be a trusted IT advisor to our customers, we recognize the importance of continuous development, training and growing our cybersecurity talent pool to defend their digital businesses against tomorrow's cyber threats. Our security professionals will continue to focus on detecting and responding to cyber and insider threats for our customers in the region and globally," added Thangasamy. According to Securing Connectivity Across the Asia/Pacific for a Trusted Digital Future, an IDC vendor spotlight sponsored by CenturyLink, November 2018, more than 80 percent of organizations in Asia Pacific do not have security proficiency or an optimal security program. IDC also predicts that by 2020, 30 percent of security spending will be with vendors offering integrated security solutions that are powered by the latest advances in artificial intelligence, machine learning, automation and analytics. "Asia Pacific organizations are facing an ever-evolving threat landscape, where the complexity of networks is changing, with businesses leveraging hybrid cloud environments to digitally transform. Organizations need to consider a 'build vs buy' model to sustain the necessary level of threat intelligence and advanced analytics capabilities along with the skills to interpret and act on findings. They will also need to undertake a holistic, enterprise-wide security posture that is proactive and predictive to combat threats and secure their business data," said Simon Piff, vice president for IT security practice business at IDC Asia Pacific. CenturyLink's global SOCs provide customers with follow-the-sun support and always-on management of the company's robust suite of advanced threat prevention and detection solutions, including custom threat intelligence derived from its extensive global IP network, cloud-based firewalls, DDoS mitigation and security log monitoring. CenturyLink's global SOCs monitor over 114 billion NetFlow sessions per day, responding to and mitigating about 120 DDoS attacks per day. Discover the depth and breadth of CenturyLink's security services: https://www.youtube.com/watch?v=LXY1rkM7RTA. Get detailed information about CenturyLink's global security portfolio: https://www.centurylink.com/business/managed-services/managed-security.html. Explore the interactive CenturyLink 2018 Threat Report: https://www.centurylink.com/asset/business/enterprise/report/2018-threat-research-report.pdf.